Real Madrid C.F. – Liverpool F.C. This Saturday, starting at 7:45pm (GMT), we can watch the most important meeting of UEFA Champions League 2017/2018: the final between Real Madrid and Liverpool. Each year, the Champions League Final moves to a different location, so this Saturday, the NSC Olimpiyskiy Stadium from Kiev, Ukraine, will be the host of this grand meeting. Real Madrid, the current champions of Champions League, is the most successful club from this European competition, with 12 titles, and 2 wins in a row: in 2017 against Juventus, with the score 1-4; in 2016 against Atlético Madrid, with the score 1-1 (during regular time) and 5-3 (after penalty shootout). Liverpool is one of the top European club, with 5 titles: in 1977, 1978, 1981, 1984, and 2005. The last win was against AC Milan (with the score 3-3 in the regular time), after an amazing return in the second half, when they have scored 3 goals: S. Gerard (in 54′), V. Šmicer (in. 56′), and X. Alonso (in 60′). That final was won at the penalty shootouts with the score 2-3. Real Madrid, managed by Zinedine Zidane, has 1 win (with the score 1-2) and 1 draw (with the score 2-2), against Bayern München in the previous stage of this competition, while Liverpool, managed by Jürgen Klopp, had 1 win (with the score 5-2) and 1 defeat (with the score 4-2), against Roma. – this meeting is a repeat of the European Cup Final 1981: Parc des Princes from Paris was the host of that meeting, when Liverpool has won the final with the score 1-0 (the 3rd title won). For Real Madrid, that was the last defeat in the finals of this competition. Cast your vote in below Poll! 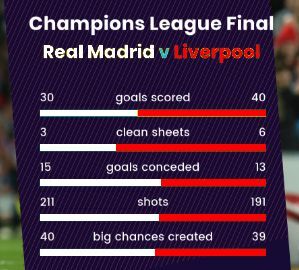 Who will win the Real Madrid - Liverpool match? Odds collected on 22.05.2018. Subject to change.